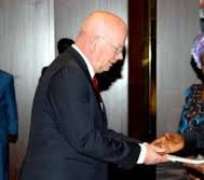 The United States new Ambassador to Nigeria, James Entwistle, on Wednesday said that the U.S would continue to support Nigeria in fighting corruption and promoting good governance. Entwistle, in a statement issued by the U.S. Embassy Senior Information Specialist, Mr. Sani Mohammed, also said there were plans to expand bilateral trade and investment between the two countries. 'I will continue focusing the United States efforts on partnering with Nigeria to develop measures to more effectively fight corruption and advance transparent and accountable governance,'' the News Agency of Nigeria quoted the envoy as saying in the statement. He also expressed the readiness of the U.S. government to work closely with the Nigerian government in reducing violence and terrorism. He added that the U.S. government was going to address 'legitimate economic needs' of Nigerian communities vulnerable to violence.